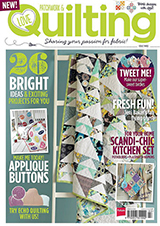 So you've made your quilt binding, and now it's time to attach it to your quilt! There are lots of different ways to do this of course, but this is how I do it. 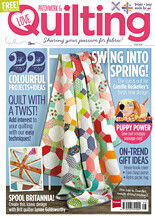 First of all, I recommend squaring up your quilt before you begin. 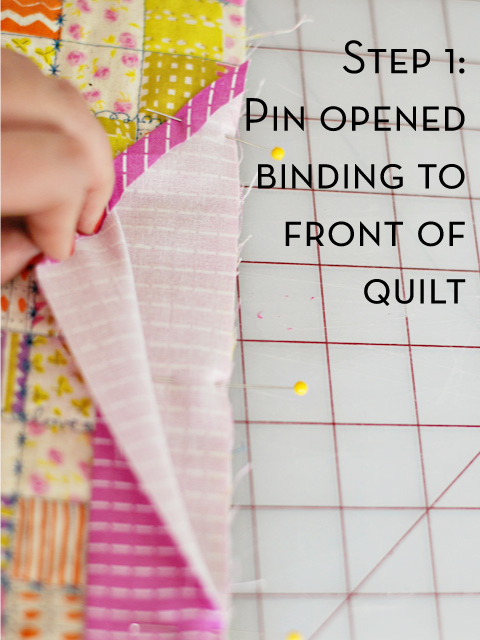 I may do a separate tutorial on this at some point, but basically just cut your quilt down to the desired size you want before you start attaching your binding, making sure that the edges are straight and the corners are square. 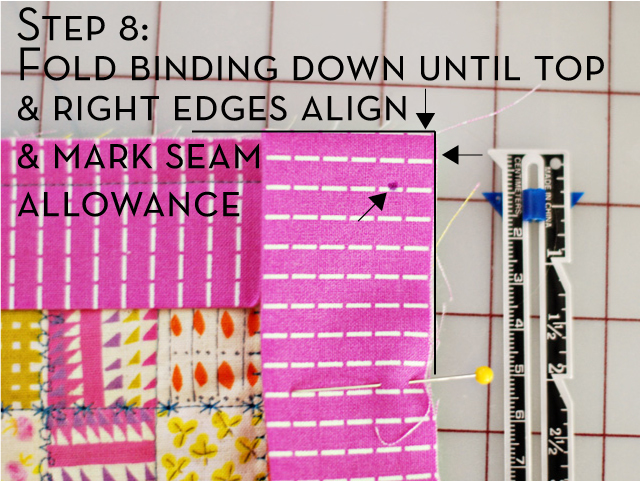 This helps to make sure the sides of your finished quilt are nice and straight and at 90 degree angles to each other. 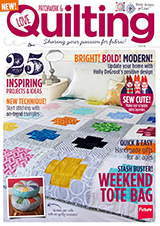 Once your quilt is squared up, you're ready to start! Step 1: Pin the starting edge of your binding (the side with the bias end) down to the side of the quilt, with the raw edge matched up with the edge of your quilt. You want to start in from one of the corners a bit by at least a few inches to avoid bulk at the corners. A few inches of your binding should be open at this point, you are only going to pin down the bottom layer of binding to the quilt. You'll only need a few pins to get started. Step 2: Start stitching down the binding, just in from the start of the binding. I use a 3/8" seam allowance here when using a 3" wide binding strip. 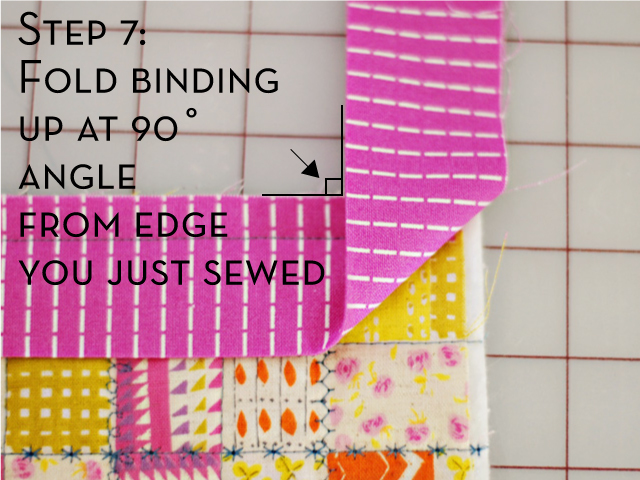 If your binding is 2.5" or your quilt has points that would get cut off when using a 3/8" seam allowance, I'd recommend using a 1/4" seam allowance instead. 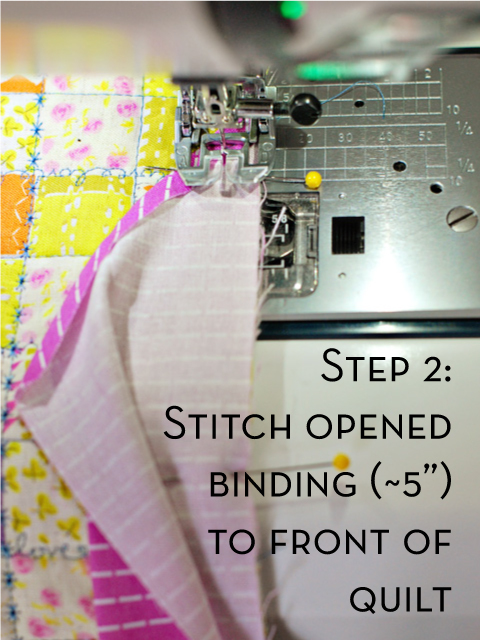 Backstitch at the beginning of your stitching. You're only going to sew about 5" of binding down at this point. Step 3: After you've sewn about 5", backstitch and close the binding. 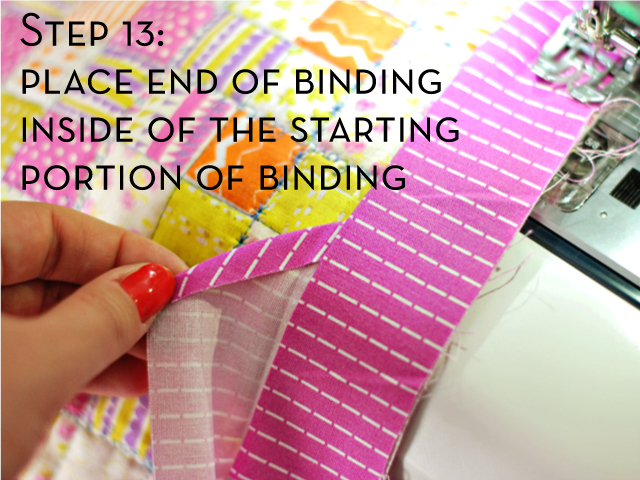 Start stitching in the same place you left off, but this time with the binding closed. Backstitch at the beginning again. 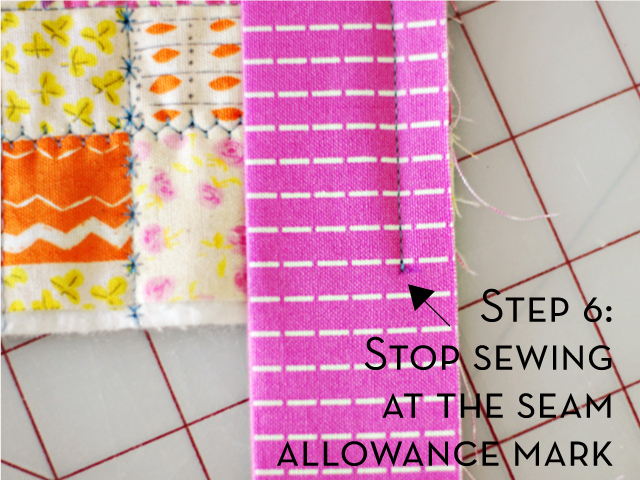 At this point, it helps to make sure you have your machine set to needle down, so that the needle stops in the down position when you stop stitching. 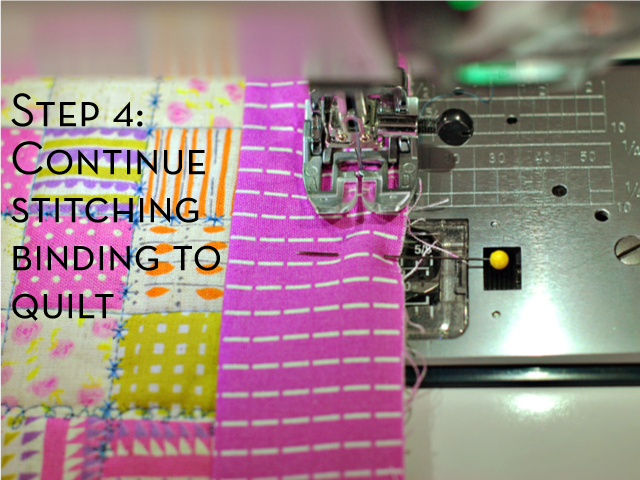 Step 4: Continue sewing with the same seam allowance (3/8" or 1/4") until you get a few inches from the corner. Step 5: Measure in from the bottom edge of the quilt, and mark your seam allowance. After awhile you'll get familiar with how far in you need to be, and you won't have to mark it anymore if you don't want to. 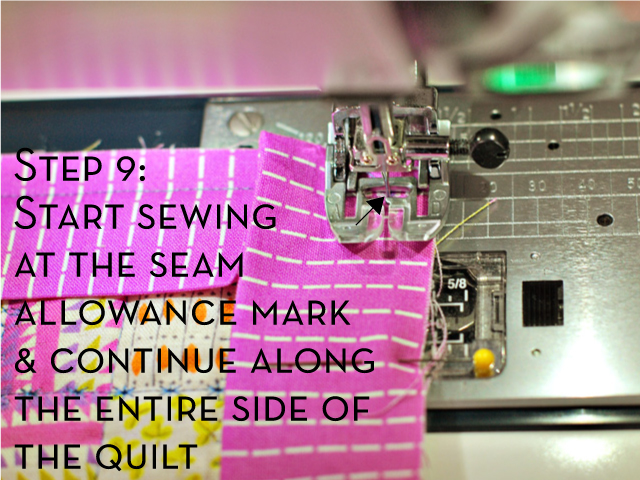 Step 6: Continue sewing, stopping at the seam allowance mark you just made. Backstitch at the end and trim the threads. Step 7: Now we are going to establish the mitered corner of the quilt. 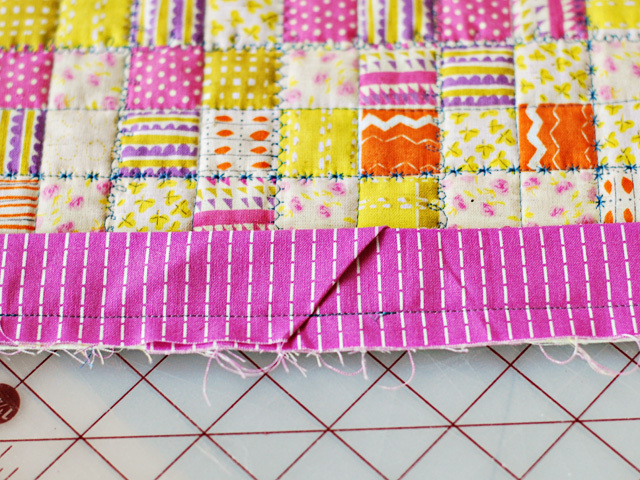 Turn your quilt so that the next unfinished side of your quilt is vertical. Fold the binding up, making a 90 degree angle between the top edge of the quilt (the side you just finished attaching the binding to) and the loose binding piece that you just folded. Finger press the 45 degree angle that you just created in the binding to make a crease. Step 8: Holding the crease you just created with one hand, fold the binding back down with the other hand until the top fold is aligned with the top edge of the quilt, and the right (unfinished) edge of the binding aligns with the right edge of the quilt. Pin the binding into place if you need to at this point. 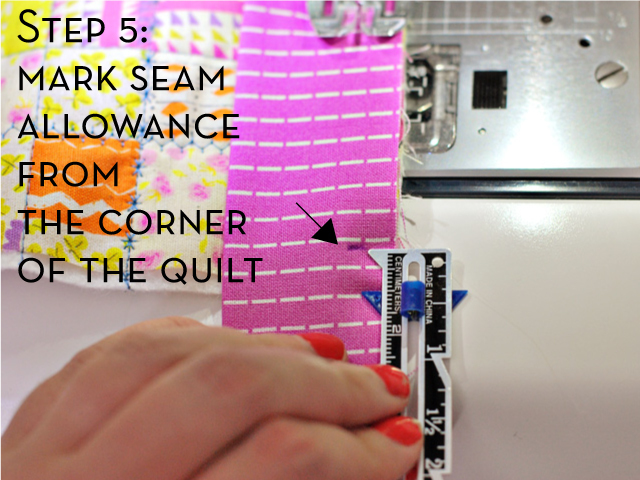 Measure in from the top edge to mark your seam allowance. Step 9: Begin sewing again at the point where you marked your seam allowance, backstitching at the beginning. Step 10: Continue sewing the binding down until you get a few inches from the corner of the quilt. 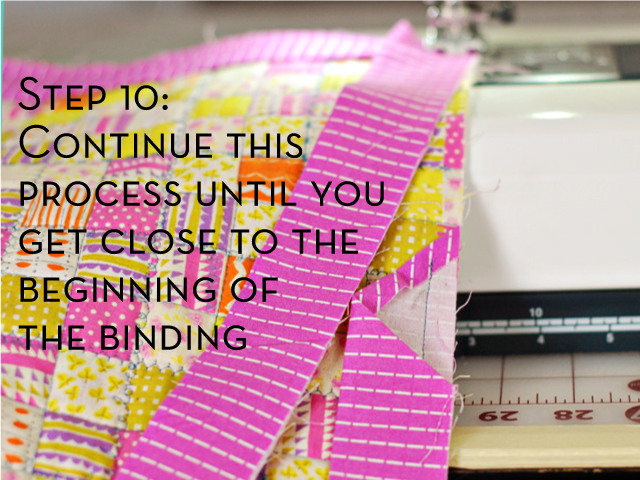 Repeat Steps 4 - 9 until you get a few inches from the starting end of your binding. Step 11: Now we're going to get ready to close the binding. Place the loose end of the binding on top of the starting end of the binding. 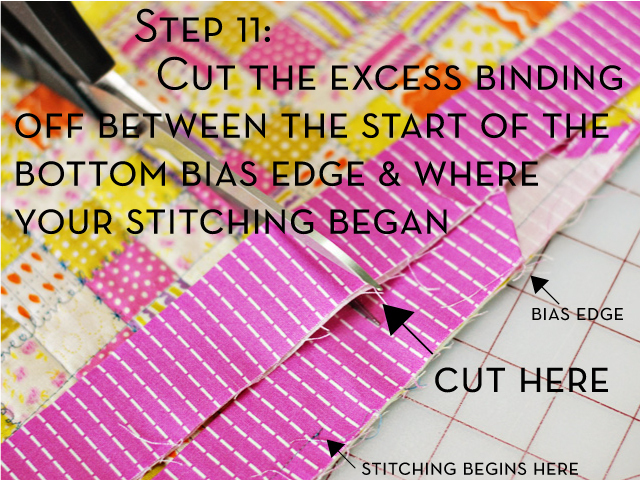 Take note of where the bottom bias edge is, as well as where your stitching begins through both layers of the binding. Cut the loose end of the binding about halfway between these two points. Step 12: Open the starting end of the binding where you had only attached one side to the quilt. 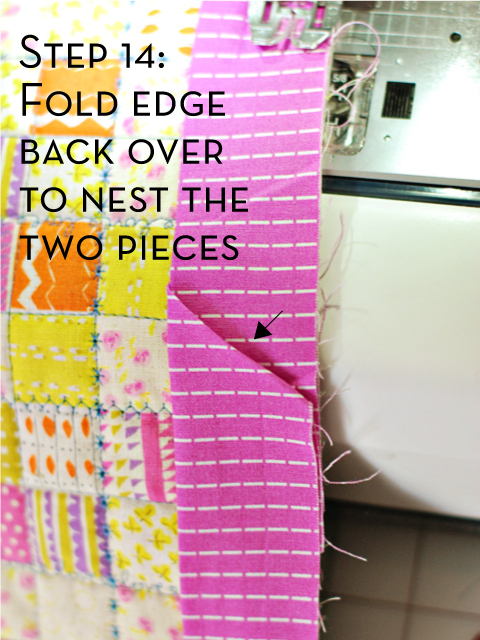 This will make a little pocket for you to nest the loose end of the binding in. Step 13: Place the loose end of the binding inside of the starting end of the binding. Match up the unfinished edges so the two binding strips are aligned. Step 14: Fold the open edge of the starting end of binding back over onto the loose end of the binding to nest the two pieces together. If you cut it in the correct place in Step 11, it should easily fit into the pocket, with the bias edge overlapping the loose end of the binding. 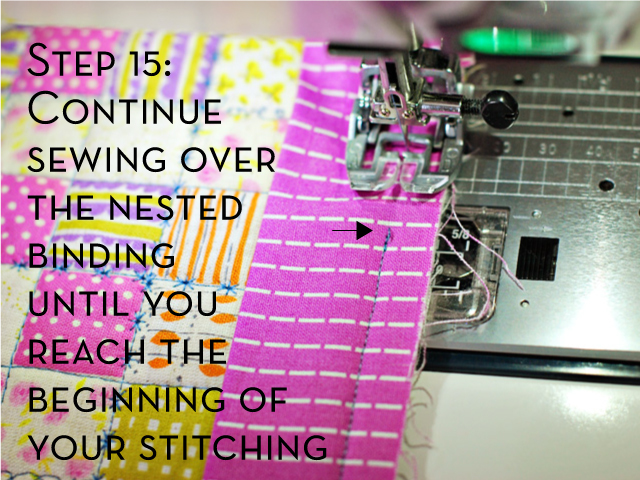 Step 15: Continue sewing over the nested binding, treating it like you would a continous strip of binding. When you reach the beginning of your stitching, backstitch again and stop. Trim your threads. That's it! 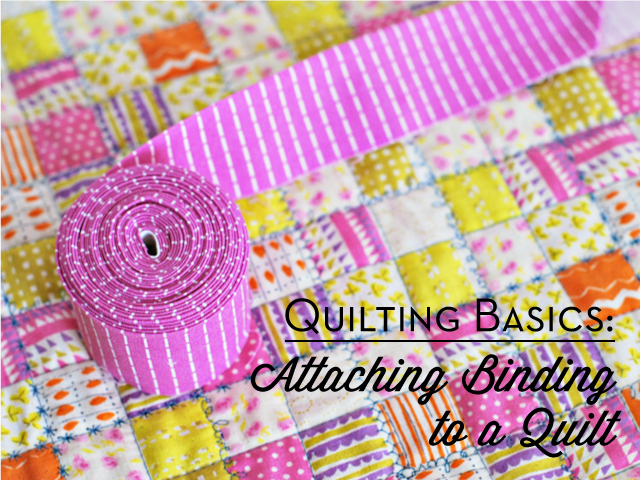 Your binding is attached to your quilt! There will be a little pocket that you can stick your finger into, but it won't create any problems (fraying, etc) since the unfinished ends are so far inside the binding. I find this way much quicker than other methods of joining the two ends of the binding. All that's left is to handstitch the binding to the back of the quilt, which we'll talk about soon! I have never seen this done before but I think it's genius! The binding part of the quilt is the most frustrating for me. I am excited to try this method. ooh, I've never tried your ~5" starting trick - that is definitely being implemented in my next quilt. Do you always hand-finish your binding? Thanks for this tutorial. I had an "a-ha moment" while reading through it. 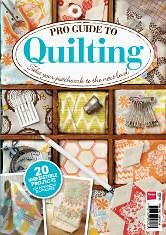 I'm a newish quilter and I've been using a similar method just by guess and by golly (not feeling confident enough to try matching up the ends and trusting I won't get a pucker). Your method is even better, though, because of the way you create the channel for the end piece at the beginning. Oh! I love that little nesting trick. So much easier and looks great! Thanks for the tutorial! aha! the suspense was killing me and now it all makes sense. that's a nifty little trick that i might have to try next time. joining the two ends of the binding at end always gives me such a huge headache. I agree, joining the two ends always has me in a tizzy before its all said and done. I love the 5 inch starter seam-I can see how that would stabilize it so well. Thanks for sharing! Thank you for this, all help is needed to do my first quilt. I'm going to have to try this! So much easier than fighting with joining the ends like I've been doing! Great tutorial, Holly! 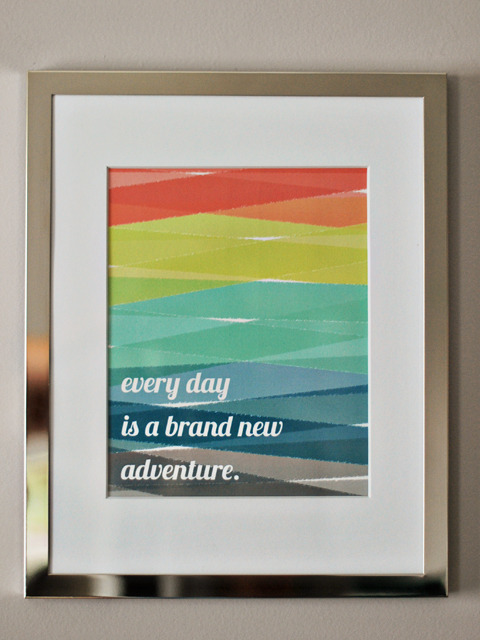 And your font looks amazing on the pictures. Thank you for this tutorial. My least favorite part of binding (which I otherwise enjoy) is joining the ends... 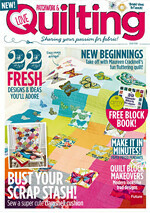 I will have to hurry and finish another quilt so I can try your awesome method. Thanks again! 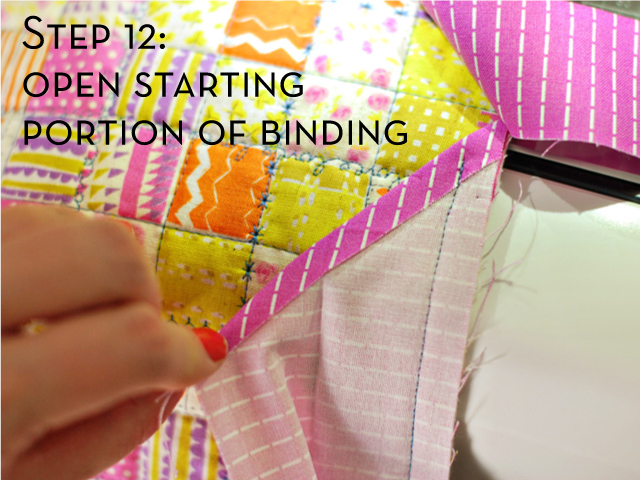 Great tutorial on putting on binding!! Great tutorial, Holly! It is always fun to see how other people finish off quilts...or make quilts for that matter. 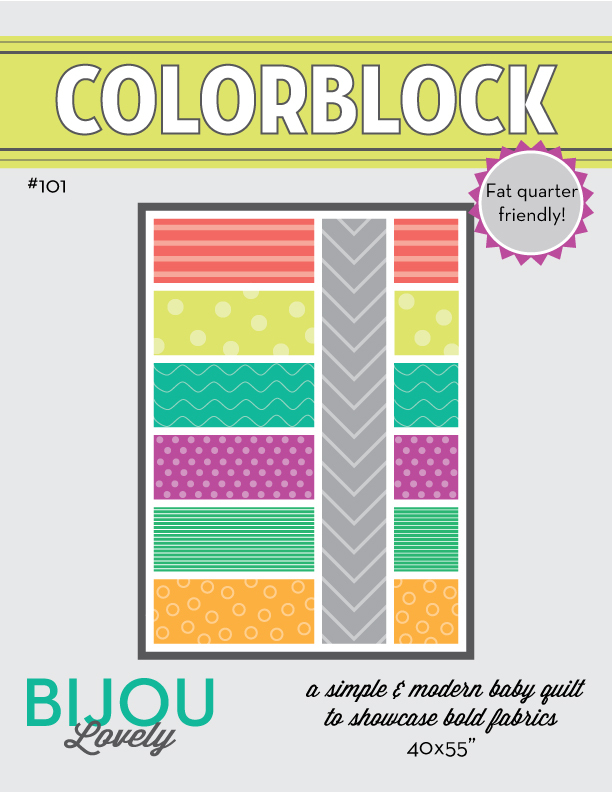 Oh thank goodness you'll be doing the next one "soon" (ie hopefully sometime this fall) because I have my first quilt ever (using your color block pattern) and I am oh so nervous about the binding! 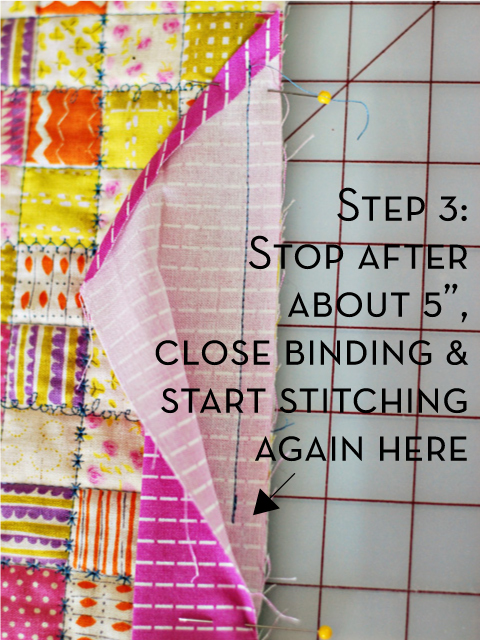 Just tried this and I'll never finish binding another way again! Thanks for the tip! Sew cool...sew easy. I needed to find an easier way to join the binding ends and this is it! Thanks so much! Fantastic! 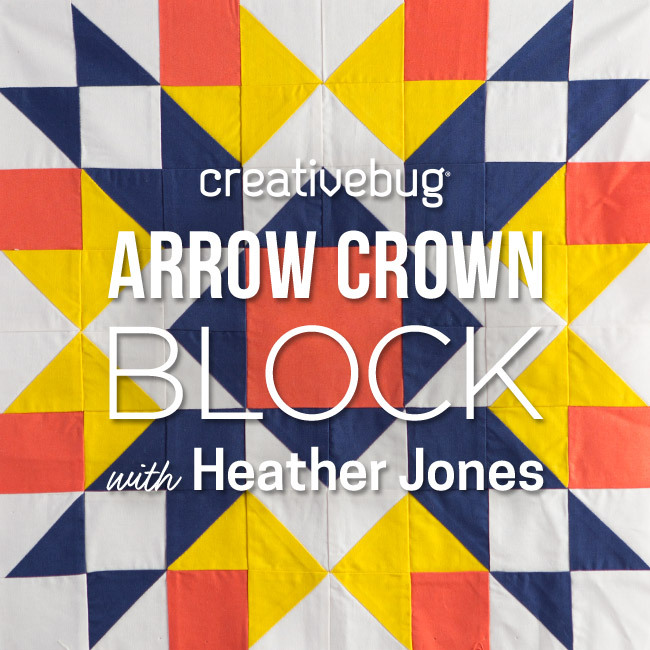 I made your color block quilt, made the straight-grain binding, and just sewed it to the quilt, all using your tutorials! I'm ready for the "how to hand sew the back" tutorial now!! :) thank you! 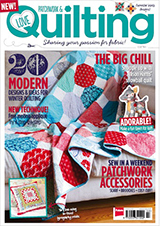 I'm completely into quilting now! Thank you, thank you, thank you. Great tutorial. Just what I needed. Ahhhhhh, I love you! Wish I would have known this yesterday. So excited to try this. Thanks for such a clear tutorial ! Thank you so much for this tutorial! I much prefer this way to begin and end the binding process. It was a big success on my daughter's quilt that I just finished off!